Escape to one of the Cancun’s most intimate and charming Hotels in the Mexican Caribbean, Beachscape Kin Ha Villas & Suites, located on the best beach in Cancun, Mexico. The one, two and three-bedroom suites and Villas are ideal for romantic getaways and family vacations of all sizes. Unlike other massive properties in Cancun’s Hotel Zone, Beachscape Kin Ha was designed with guests’ peace and relaxation in mind. The small resort is home to a swimming pool, playground, two excellent restaurants and lush green landscaping, yet they consider their greatest asset to be their beautiful white sand beach – voted best in Cancun by the Discovery Channel and the certification of Excellence 2013 with Trip Advisor. The service at the Beachspace Kin Ha Villas & Suites Cancún combines modern indoor and outdoor facilities with the best personalized attention and other details that will help you to experience something different every day on your holiday in Cancún. The resort in Cancún offers you two restaurants. La Albufera with a large, varied buffet where you can try international dishes and a snack bar with an outstanding atmosphere. La Palapa with seafood specialties and Mexican food and a snack bar with a view of the beach and the Caribbean Sea. Allowing the youngest visitors to have fun whenever they like. The well-tended gardens that surround the resort in Cancún are an oasis of tranquility and peace. There is an outdoor parking always at your disposal here at the resort in Cancún. If there is a space at the resort in Cancún where you will be able to find that perfect balance between body and mind, that is the spa at Beachspace Kin Ha Villas & Suites Cancún: an area that is designed especially to treat stress that has been accumulating during the year and convert it into positive energy and health. The spa in Cancún offers one of the most renown chocolatherapy treatments that will give your skin a boost of vitality and improve on your mood: it exfoliates, smooths and hydrates. One of the most exclusive treatments at the spa in Cancún is a magical blend of citrus fruits that will exfoliate and give exceptionally smooth skin. Beachscape Kin Ha Villas & Suites Cancun is an ideal Cancun lodging choice for your trip to Mexico. 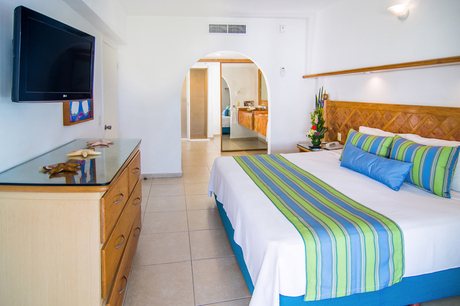 With numerous amenities for guests such as room service, car rental, children's play area, you will wake up at Beachscape Kin Ha Villas & Suites Cancun feeling invigorated every day for your time in Cancun. Don’t let this amazing reservation opportunity pass you by, book your stay at Beachscape Kin Ha Villas & Suites Cancun today to make the most of your time in Cancun, Mexico. Located on the best beach in Cancun, Mexico.